Plaza Paver™ selections are available depending on your location in the country. The map indicates the corresponding series available for your area. 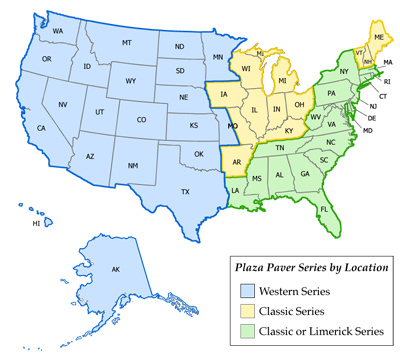 Please note that the states highlighted in green can choose from either the Classic or Limerick Plaza Paver Series. The Western Series is only available to the locations indicated in blue and the Classic Plaza Paver Series is available to the states shown in yellow. Click on the series for your area to view the color profiles and finishes available to you. 10 year limited material warranty. Download or view our Westile Plaza Paver 10 Year Limited Material Warranty for full details. This includes a sample warranty registration form.